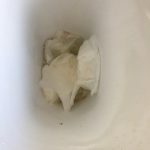 Is Worm in Toilet Roundworm? While the color of this worm is similar to that of an earthworm, we don’t believe this is an earthworm. This creature doesn’t have a segmented body or a clitellum, both of which are characteristics of earthworms. 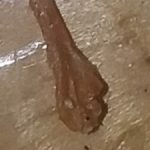 Now that we have a better view of the specimen, we think that our reader might be right, this could be a roundworm. 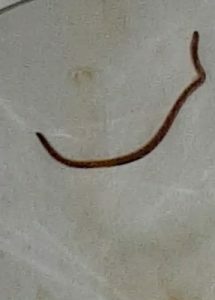 Like the specimen in the photograph, roundworms have smooth, symmetrical bodies with tapered ends. Roundworms are parasites that feed and reproduce in the gut. A roundworm infection can occur if you swallow the microscopic ascaris eggs in contaminated food or water, or if you accidentally touch your mouth with your hands after handling contaminated soil. 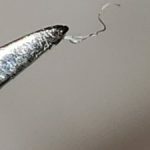 Although roundworms are parasites, most people don’t experience any of the severe symptoms associated with parasites, and only realize they have roundworms when they see an organism in their stool. 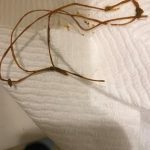 Our reader didn’t mention any symptoms, but since he did find this worm in his toilet, we think it would be best that he see a doctor about this mysterious worm. 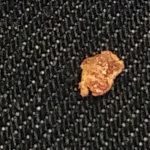 We aren’t 100% sure that he is dealing with a parasitic roundworm, but a doctor will be able to either confirm or deny this and be qualified to diagnose and/or treat our reader if necessary. Since we aren’t licensed medical professionals, we can’t offer medical advice of any kind. 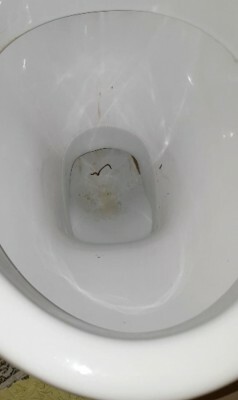 To wrap up, a reader sent us a photograph of a brown worm he found swimming in his toilet. We think this might be a roundworm, which is a parasitic worm that lives in the gut. However, since we aren’t medical professionals, we encourage our reader to see a doctor as soon as possible to weigh in on the matter. We wish our reader the best of luck and good health! 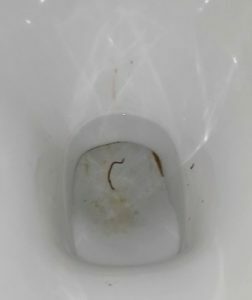 A reader sent us a photograph of a brown worm he found swimming in his toilet. 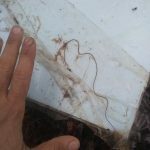 We think this might be a roundworm, which is a parasitic worm that lives in the gut. However, since we aren't medical professionals, we encourage our reader to see a doctor as soon as possible to weigh in on the matter. 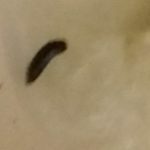 Are Worms in Stool Parasitic? 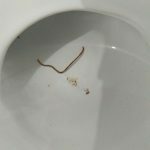 What Are Bright Red Worms in Toilet Bowl?